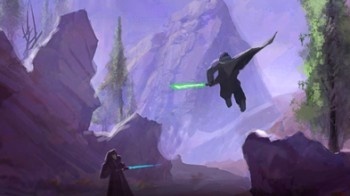 I don't care for Mythic, but their experience could help a lot with the new Star Wars MMO and Dragon Age. Anyway I hope this will shed new light into games of both studios (especially Warhammer Online). I hope Mark finds something soon, the man has a lot of good ideas and potential. ...I'm not sure whether to cry or cheer. Over at Warhammer Alliance, where I serve as Assistant Site Manager, this has set off a flurry of speculation, from what this means for WAR, to what it means for SW:TOR and more. From our perspective, WAR has done decent, but has suffered from the "overhype/underdeliver" syndrome of the past few MMO releases. Sadly, Mark Jacobs was a big part of this, and the very public quotes he created for the game pre-release (such as quoting exact sub numbers for profitability and server numbers as a gauge for success) hurt WAR's reputation and were probably not set as realistically as they could have been. WAR has trended downwards in subs but has remained steady at 300k since the beginning of the year. It's unknown where subs are now, but a major content patch was just released, so what that means for the game remains to be seen. The Post-WoW syndrome has created unrealistic expectations from players and developers alike to reach millions of subs and mass market appeal, but has contradicted that by sticking to a core vision that really isn't mass-appealing. WoW is the McDonald's of MMOs, taking from other titles to create casual-friendly, gateway gamer appeal, and if you're not willing to do that, you won't reach their numbers. But not reaching them doesn't mean you fail as an MMO. WAR, by non-WoW standards, is doing just fine. I have a balanced view of them and know there are problems, but said problems have been addressed in a progressive manner these past six months. We respect Mark for what he's done, but when it comes to when something isn't doing as well, the top of the chain is the first to go. We've had a lot of contact with the Mythic team and they are all hardworking, dedicated people, so it isn't for lack of trying. This honestly can only be beneficial to both companies. Bioware has tons of developer equity but has zero MMO experience, something Mythic can certainly offer in terms of dealing with crazy MMO fans like us. Mythic can benefit from a fresh direction for WAR and the successful practices that have made Bioware a successful and positively perceived company. There are tons of people speculating that WAR is on the chopping block with Bioware in charge of the new combined group under EA, but I don't know we can say that. If EA can create profitable markets in both the fantasy and sci-fi MMO areas, it will end up being extremely powerful as a player in the industry. All us single player rpg fans are just keeping our fingers crossed that this doesn't mean bioware will be an mmo company now. [B]EA announced its intentions to merge its RPG divisions - most prominently including Mythic and BioWare - into a single RPG/MMO studio helmed by BioWare founder Ray Muzyka. I have to correct that immediately. We are not "one studio." It just means that all of the studios are now gathered under a single heading and label, while operating as normal. As long as they give me a brilliant Star Wars MMO, Im happy enough to ignore the politics. Will there be any name changes? Studios WANT the single player game to die, it makes their lives a whole lot easier. Less AI to program, less reason to hire writers to work on a story, less need to include meaningful gameplay in the case of MMO's (replacing it all with frustrating grind) and of course, subscription/micro transaction based games which require you to spend money constantly to keep playing. It's a big corporations dream, cut costs and increase profit. Aw Jesus, seriously... Bioware was doing fine, Mythic was failing, they didn't want to kill the cheese-giving cow that is called Warhammer Online. Seriously? I hope BioWare doesnt stop making Single Player RPGs. So BioWare still lives? Wait.. You work for them? I feared something like this would happen, but I didn't want to believe it. BioWare's integrity has been compromised! DAMN YOU, EA! DAMN YOU TO HELL!!! This is the kind of Chicken Littling I disagree with. It's an extremely slippery slope to predict, at least in the thread that we have on our site, everything from WAR being shuttered, to Bioware and Mythic combining into a single studio (they're just merging into a group consistently managed, now), to SW:TOR being tainted forever. People need to calm down and not pose speculation as fact. In other news, EA plans to acquire Blizzard and Bethesda to further their goal of forming RPG Voltron. Of course the two studios are not fully merged, but now Dr. Ray has to deal with a lot of extra dead weight as he is now in effect the leader of Mythic, beyond the EA suits, at any rate. That's what I meant by BioWare's integrity being compromised. Ah ha! So that's who beat me to informing the Escapist. I'm not surprised. Mythic arent dead weight, ok there not the most famous company in the world but they are talented, watch this space. I'd add "as long as they don't put Mass Effect 2 or Dragon Age on the back-burner." I disagree immensely with the assertion that MMOs are only frustrating grind and cannot have meaningful gameplay. Or that they don't need writers, or solid AI. Wow. Didn't see that one coming. I just hope that this doesn't mean that either studio will slow down in their respective gaming niche. The only MMOs I play are Mythic; that being Warhammer Online and Dark Age of Camelot (to a lesser extent). Bioware is probably my favorite gaming studio out there, and I will sometimes try titles for no other reason than Bioware did it (see Sonic Chronicles). Long as Bioware keeps making the single player RPGs, I'm happy. Them also having input on MMOs might be neat. The day this happens is the day I simply stop playing new games and dig out my Genesis. I really see nothing but good things coming from this, but feel free to flame me if you think otherwise. for starters, Bioware now has people that have been working on a MMO [although to be fair, Warhammer Online bored the hell out of me] that can help logistically and technically for any problems that may arise. Sure, we can speculate that Mythic might screw with some things in SW:TOR, which could be bad, but lets wait for that till later. And for everyone that still plays Warhammer, now they have a very good game developer to help out around the game [though, taking into consideration how long it took for the Mass Effect DLC, you might have to wait longer for any expansions. I'll add the Mass Effect 2 bit, not too familiar with Dragon Age. Yeahhh that looks pretty cool as well. Great, so now we get Paul Barnett hyping TOR? They would need to buy Activision for Blizzard...and thats impossible considering Activision is worth more than EA. If you do I shall fall to my knees and worship you for working at BioWare. My Second Fav game company. Ah...let's just say I don't so that I can avoid a weird scene. I won initiative btw. Sneak Attack against your Flat Footed AC. If this is any way affects SWTOR is a bad way, I shall taunt EA not once, but twice. I will then bite their knee caps off. Then beat them with a herring. I've never played one that doesn't require a significant amount of grind, has a decent cast of characters and a story that actually presents itself instead of being deeply hidden in the background. However in a sense I suppose you are correct. The only real sin of MMO's is the Monthly Fee, a very lucrative pie that every studio desperately wants a piece of. The only real sin of MMO's is the Monthly Fee, a very lucrative pie that every studio desperately wants a piece of. I'm going to play devil's advocate here solely to amuse myself. I buy new games fairly frequently; enough that it generates a decent monthly cost to keep supplying myself. One of my co-workers, on the other hand, has been playing Warcraft for a number of years. He pays about $12/month to be entertained, while I pay...well, let's just say it's significantly more than that. I have difficulty arguing against monthly fees when a game is well maintained, has frequent injections of content, and is capable of entertaining people for such great lengths of time. It's apparently costing them far less money than it's costing me. For the record, designers retain all dexterity bonuses when caught flat footed. It's how we deal with scheduling changes.